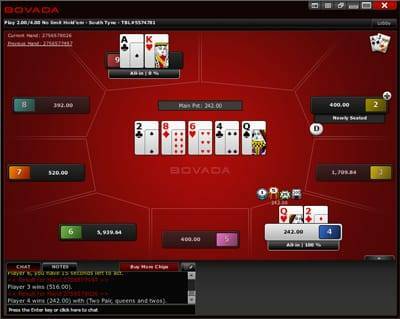 Bovada Poker had served U.S. residents for several years before closing its poker room in 2016. But now it’s back with the same poker platform that made it a household name among American poker fans. Bovada accepts players from the USA except Delaware, Maryland, New Jersey, New York and Nevada. Upon making your initial deposit at Bovada Poker, you’ll be able to get a 100% up to $500 bonus. 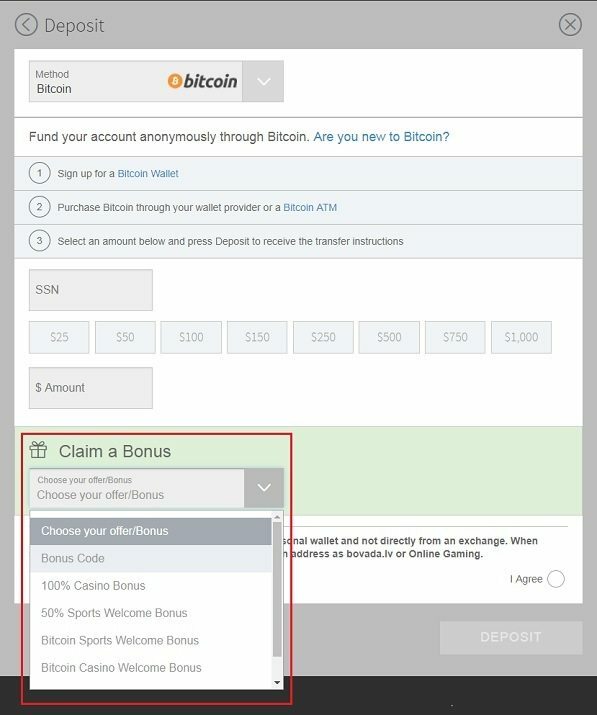 There are further bonuses available for the casino and sports sides of the company, and the total amount of cash you can claim increases if you use the digital currency Bitcoin. Read our review of Bovada Sports, Casino and Poker for all the information regarding these additional offers. 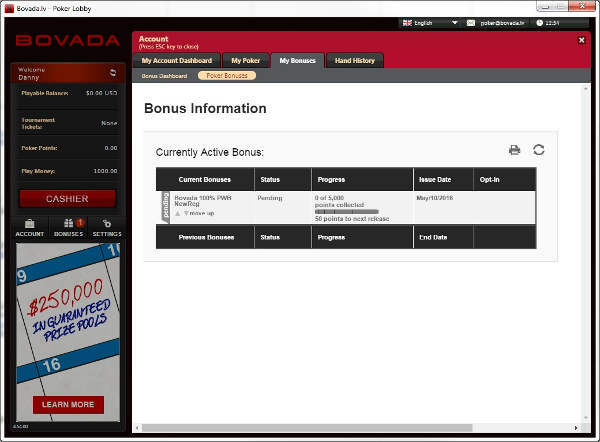 Before you even worry about the Bovada Poker bonus, you’ll have to first create an account. Simply follow our link to visit the Bovada poker room. A registration form will appear in the center of your browser as shown to the right. Fill in this page with your accurate personal information. When you’re ready, press “Open Account” to submit your data and open your new Bovada account. After doing this, you’ll be logged into your account. To make a deposit, click “Deposit” near the top of the screen. A deposit window will appear, and you might have to input your street address at this point before the system will allow you to continue. You’ll be able to choose between credit card and Bitcoin payments. For the majority of our users, we recommend Bitcoin because it’s fast, and there are never any fees on either depositing or withdrawing. Near the bottom of the deposit screen, you’ll see a drop-down menu for choosing the bonus you want. There are differences between the various sports and casino promos on offer, but whichever one of them you select, you’ll get the same 100% up to $500 poker bonus. After you enter the amount you wish to deposit and all the other information required, including the bonus package you wish to take advantage of, check the “I agree” box and hit the “deposit” button. Once your account is set up, you need to click on “Download Poker” from the Bovada website. Your download will begin. Once it’s completed, run the file, and the setup wizard will open up. 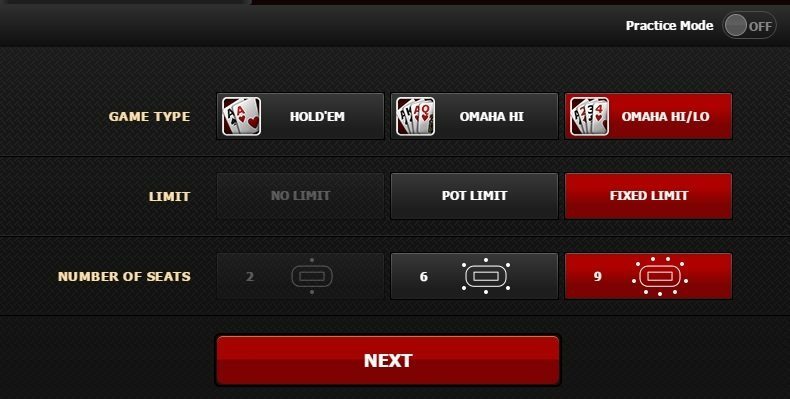 After progressing through the installation, the Bovada Poker client will be ready for you to use. Open it up, and log in with the account credentials you specified earlier. Now you’re ready to begin earning your bonus money! The complimentary bonus funds won’t be added to your account upfront. There are certain steps you’ll have to take to unlock them. Read the info below to learn how to pad your real money balance with the Bovada Poker bonus. You’ll have 30 days to try to unlock as much of this bonus as you can. Once the bonus money hits your account, it’s completely unrestricted, and there are no further rollover obligations that you’ll have to meet. Keep playing, or withdraw it at your leisure. Combining all these numbers together, we see that a $500 deposit entitles you to a 100% bonus of $500, which requires 5,000 points to fully clear. If you play tourneys or sit-n-goes, you’ll have to pay (5,000/3) = $1,667 in fees to collect the entire $500 sum. This represents a rakeback percentage of 30%. In ring games, it’s really hard to tell what the exact Bovada rakeback equivalent would be, but it’s probably a bit less than this. One thing to note about the poker bonus at Bovada is that the value is front-loaded. That is, the first few bonus payouts are released at a much better clip than the subsequent ones. For instance, the initial bonus portion refunds you 100% of the first $5 in fees you pay while the next grants you an 86% rebate on $23.33 of fees. Bovada is therefore an excellent place to play for those on smaller bankrolls or who won’t be able to put in the time to clear the whole bonus. Bovada allows you to send a referral link to your friends. If one of them uses your link to sign up, you’ll get a 200% up to $100 referral bonus based on the size of that person’s first deposit. 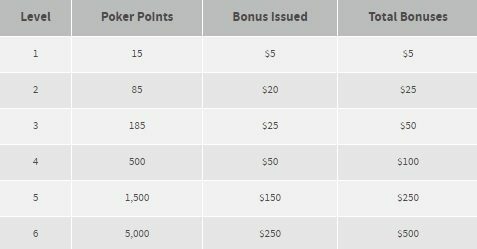 To clear the bonus, you’ll have to gather six poker points per dollar of this bonus or complete a 30x rollover in the casino or 5x in the sportsbook. Your poker points can be traded in for tournament tickets. The options range from a $2.20 ticket for 440 points up to a $270 ticket for 54,000 points. There are many choices in between, so you can find one that fits within your comfort level. 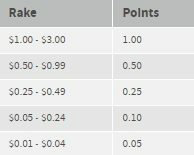 Poker points expire after 18 months of account inactivity. You can play No Limit Hold’em from $0.02/$0.05 up to $10/$20 in 6-max and full-ring formats. For heads-up tables, the games run up to $2.50/$5.00. There are two other big-bet variants provided: PLO and PLO/8. Both of them can be found at the same blind levels as NLHE. Limit cash games consist of Hold’em and LO8 as high as $30/$60. Sit and gos are present from $1 + $0.05 up to $200 + $14. 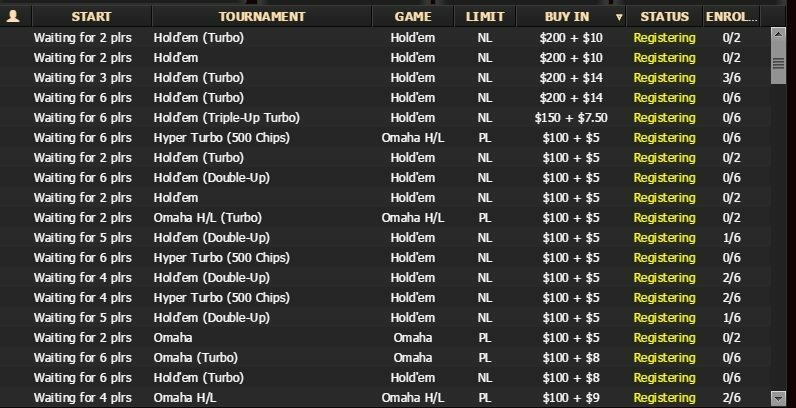 Most of them are NL Hold’em affairs, but there are a few PLO and PLO Hi-Lo SNGs. Besides normal structures, you’ll also find Double Ups, which are pretty much the same as the Double-or-Nothings offered at some competing sites. Triple Ups extend this principle even further, awarding the top third of the field a prize equal to three buyins. Besides single-table games for 2, 6, and 9 competitors, there are also 12- and 27-person contests that feature multiple tables. Bovada tournaments hand out more than $1.5 million in prizes every week. Buyins span the range from $1.10 up to $250 + $20 although there are usually pricier events available whenever the site runs one of its frequent MTT series. On a weekly basis, the most interesting event is probably the $100,000 Guaranteed, which runs on Sundays and costs $150 + $12 to enter. The poker room at Bovada isn’t quite the same as at most other sites that serve the United States. Many things set it apart and give it a distinctive feel. When you make Bovada your poker home, you’ll get to try out some of these elements. There’s no identifying information shown about any player at any table at Bovada. This is true not just for cash games but also tournaments and sit n’ gos too. You’ll just see a number listed next to each opponent. What this means is that player tracking software doesn’t work here, at least not for more than a single session, and so nobody can target another player over the long term. Recreational users feel safe here, so the tables are not as tough as at most other places for U.S.A. internet poker. Similar to Full Tilt’s Rush Poker, Bovada’s Zone is a fast-fold format. Whenever you fold your cards, you’ll move instantly to a new table and get a new hand. There’s no waiting around for the rest of the table to act, letting you see hands at a much faster pace than you could in a regular game. Zone Poker Texas Hold’em is offered up to $1/$2, and for Omaha, the highest blind level is $0.10/$0.25. In 2017, Bovada added a Quick Seat feature to its ring game poker lobby to help players get into the games they want as rapidly as possible. You need only choose your game type, betting format, size of the table, and stakes. The software will then seat you at a matching table, so you won’t have to scroll through the lobby or fiddle around with waiting lists. Bovada.lv makes it easy to get in touch with support personnel who can help you with any issues you encounter. 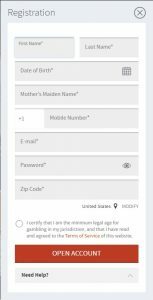 There’s a contact form that you can fill out so that the site can email you a response, but it’s probably better to use Live Chat or the toll-free telephone number. Join up at Bovada Poker today! Read our review of Bovada Sports and Casino bonus codes here. Find additional information on the latest Bovada promotion codes here. I like how Bovada is more of a casual environment as opposed to PokerStars where you feel your being hunted down by sharks. All the tables at Bovada are anonymous, so no one knows who you are! I only play the low stakes but the SnG's seem fair and fun. Will stick around and try to build up my bankroll. Glad I found the site, 5 stars!